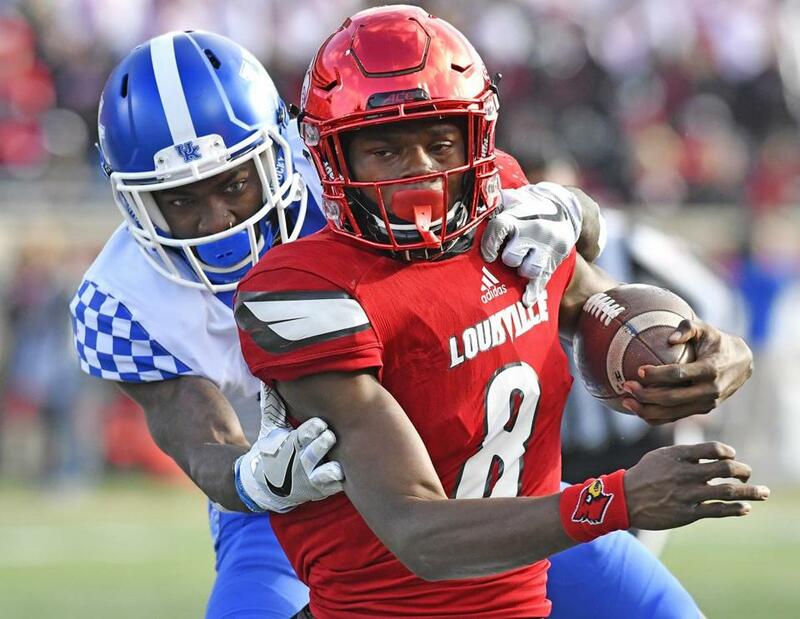 Louisville quarterback Lamar Jackson picked up two major awards Thursday night. But the one he really wants is still to come. Most of college football’s big honors were handed out during a ceremony in Atlanta, and Jackson (51 total touchdowns) took home the Walter Camp Award as the national player of the year, as well as the Maxwell Award as the best all-around player. He’s the favorite to win the Heisman Trophy on Saturday night. Jackson didn’t win the Davey O'Brien Award as the nation's top quarterback; that went to Clemson’s Deshaun Watson for the second year in a row. ‘‘He’s a tremendous player himself. He’s done lot of great things,’’ Jackson said of Watson. ‘‘If he does [win the Heisman], oh well. Best man.’’ D'Onta Foreman of Texas captured the Doak Walker Award as the nation's top running back, and Oklahoma's Dede Westbrook won the Biletnikoff Award as the top receiver. Other individual winners were Alabama’s Jonathan Allen (Bednarik Trophy, best defensive player) and Cam Robinson (Outland Trophy, best interior lineman), Adoree’ Jackson of Southern Cal (Jim Thorpe Award, best defensive back), Arizona State’s Zane Gonzalez (Lou Groza Award, outstanding placekicker), Utah’s Mitch Wishnowsky (Ray Guy Award, best punter), and Pittsburgh running back James Conner (Sports Spirit Award). Colorado’s Mike MacIntyre was named Coach of the Year, and former coach Steve Spurrier was given the NCFAA Contribution to College Football Award . . . Former Baylor coach Art Briles is suing three school regents and a vice president for libel and slander, claiming they falsely stated he knew of reported assaults and alleged gang rapes by players and didn't report them. The lawsuit also asserts that Baylor conspired to keep him from getting another job. Briles was fired in May after an investigation found Baylor mishandled reports of sexual and physical assaults. Baylor officials did not immediately respond to requests for comment. Boston College defensive end Harold Landry was named to the Walter Camp All-America second team. The junior is tied for the national lead with 15 sacks — a program season record — and leads the country with seven fumbles forced. Landry is the 12th player in school history to earn the prestigious honor. He is BC’s first Walter Camp All-American since running back Andre Williams earned first-team honors in 2013. The last BC defensive Walter Camp All-America selection was linebacker Luke Kuechly in 2011. Landry was also named to the All-Atlantic Coast Conference second team. BC senior linebacker Matt Milano received All-ACC honorable mention honors. Commissioner Gary Bettman said there's significant opposition among team owners to continuing participation in the Winter Olympics, and the league is running out of time on negotiations to take part in the 2018 Games. Following a meeting of the league's Board of Governors in Palm Beach, Fla., Bettman said no decision was made regarding Olympics participation in 2018 in South Korea. ‘‘I think it’s fair to say that there is some strong negative sentiment in the room,’’ he said. Bettman has said a decision regarding the Olympics needs to be made by early January, giving the league time to create its 2017-18 schedule with or without a two-plus-week break for the Olympics. In other matters, the NHL does not intend to reconsider the name or logo of the Las Vegas expansion franchise after US patent authorities denied the club’s trademark request. ‘‘It’s much ado about nothing,’’ deputy commissioner Bill Daly said. The Board of Governors meetings conclude Friday. A lawyer for a couple who claim Sacramento Kings players Matt Barnes and DeMarcus Cousins assaulted them at a nightclub said they'll rely on videotapes, medical reports, and the testimony of witnesses to prove they were attacked. The lawyer, Michael S. Lamonsoff, spoke at a news conference as the couple, Jasmine Besiso and Myrone Powell, held hands nearby a day after their federal lawsuit alleged Barnes choked and knocked Besiso unconscious before both players attacked Powell with punches and kicks inside a Manhattan nightclub on Monday. In an Instagram post Monday, Barnes said: ‘‘There’s always two sides to a story . . . The side the media consistently tries to paint of me . . . And what actually happened! Don’t believe everything you read.’’ . . . Amber Stocks, an assistant with the Los Angeles Sparks, was hired as coach of the Chicago Sky. The Memphis Grizzlies signed general manager Chris Wallace and a pair of executive vice presidents in the front office to multiyear extensions. Terms were not disclosed . . . According to multiple reports, the Cardinals were close to signing free agent center fielder Dexter Fowler, who played a key role in the rival Cubs winning the World Series. Fowler will be in St. Louis on Friday for a physical. Fowler, 30, had a career-high .393 on-base percentage in 2016 and posted an .840 OPS in 125 games . . . The Rangers and Braves completed a trade involving three young pitchers. Texas acquired righthander Tyrell Jenkins and minor league lefthander Brady Feigl from Atlanta in exchange for righty Luke Jackson. Donte Clark had 12 points, Luwane Pipkins added 9 points and three steals, and UMass beat Pacific, 72-48, in the Gotham Classic opener in Amherst. The Minutemen (6-2) took the lead for good in the early part of a 23-2 run that spanned both halves. It ended with Seth Berger hitting a pair of free throws to make it 45-29 with 15:27 left. Pacific (3-5) had 19 turnovers, which UMass converted into 23 points . . . Amherst, the top-ranked men’s Division 3 team, got a layup from Jayde Dawson at the buzzer to take down No. 2 Babson, 99-97, in double overtime in Amherst . . . Steve Stricker returned from a long layoff to team with Jerry Kelly to take the first-round lead in the Franklin Templeton Shootout in Naples, Fla. The duo shot a 16-under-par 56 on in the scramble format for a one-stroke lead over Harris English and Matt Kuchar at Tiburon Golf Club. Stricker holed a breaking 60-footer on the par-5 sixth for an eagle . . . Yuzuru Hanyu took the lead with an electrifying performance in the men’s short program in Marseille, France, to stay on course for a fourth straight Grand Prix Final figure skating title. He earned his season-best score of 106.53. Americans Nathan Chen was in fifth place and Adam Rippon in sixth. Russians Evgenia Tarasova and Vladimir Morozov nailed all of their jumps for a season-best 78.60 to lead the pairs. Former top-10 player Kathy Rinaldi is the US Fed Cup team’s new captain. She succeeds Mary Joe Fernandez, the US Tennis Association announced. Russian athletes and officials who are proven to have been part of a doping ‘‘manipulation system’’ should be banned for life from the Olympics, IOC president Thomas Bach said. Bach gave his personal view one day before Canadian investigator Richard McLaren publishesa final report into alleged state-backed cheating at the 2014 Sochi Winter Olympics . . . The Court of Arbitration for Sport ruled that Russian boxer Misha Aloian and Romanian weightlifter Gabriel Sincraian will lose medals from the Rio de Janeiro Olympics after failing doping tests at the games. Aloian won a flyweight silver medal, and Sincraian won bronze in the men’s 85-kilogram weightlifting. Leeds soccer owner Massimo Cellino was banned by the English Football Association from serving as a club director for 18 months for breaking agent regulations. Both Cellino and Leeds, which plays in the second tier, were fined 250,000 pounds ($314,000) over striker Ross McCormack’s move to Fulham in 2014. Cellino’s ban takes effect from February.